Today happens to be Tuesday, which is great because I love Tuesdays. Why? Because it's the day that Abraham-Hicks plays on Hay House Radio. With archives dating back to 2004, Hay House Radio is a wealth of law of attraction programs, featuring some of the best known names associated with the new age movement. While it is completely free to listen to the currently playing program, if you want to access the archives, you'll need to buy a membership. If you do, you'll also get a Louise Hay movie DVD. No, I don't have an affiliate account (although maybe I will in future) and I am not member, just mentioning the option, which I'm sure is probably a good one. If membership is not your thing, the site also offers "On Demand" viewing, available with 2 pricing tiers: a lower cost for one time viewing, higher if you want to download the product. Hay House Radio also sponsors live events and sells law of attraction products. It advertises itself as, "Radio For The Soul" and I think it's a great tagline because of the type of programming it runs. There's something there for everybody interested in the Law of Attraction, with many slants, from green living to dreaming to psychics and more. Still, my fav is Abraham and it's usually the only program I listen to. 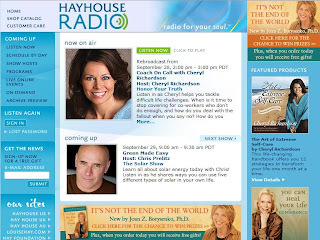 If you haven't experienced Hay House Radio yet, I encourage you to give it a try. It won't cost you anything and it just might make a certain day of the week your favourite, too. Enjoy!